Skijoring – Finally…a winter horse sport! So tonight marks the start of the 2010 winter Olympics. There will be 14 days of winter sports filled with drama, medals, and dreams. I doubt I will be watching any of it. As big of a fan of the summer games that I am, you would think that it would carry over, but not so. One of the main reasons is that I have never been into winter sports. I have tried skiing once…and failed at it. Ice skating? That just means a trip in an ambulance to me. Even sleding is dangerous to a klutz like me. I had given up on winter sports until I found something that I think both Phoenix and I would be PERFECT for. Skijoring! Skijoring, as you can see from the video above, is where a skier is pulled at high speed by a galloping horse and rider combo. Since Skijoring is still relatively new to the world of competitive sports (it did not become sanctioned in the US until 1999) there are several different types of competitions. The most common, and easiest to start is a quarter mile speed race with slalom jumps involved. Above and beyond that some have accuracy tests like in the video above, or style points for jumps using a judging panel, and others have no jumps at all and are just straight and flat race. The quarter mile distance seems essential to any competition and whatever people add to it above and beyond that seems to be done competition by competition. So you think this looks like fun and you want to do it yourself? Go for it! All you need is snow, and lots of it, a horse (which if you are reading this blog there is a good chance that if you do not have one of your own you could probably borrow one) , a skier, and a harness with a pull rope which is called a Skijoring strap. If you ride western many people skip the harness all together and just attach the rope to the horn of your saddle. It is also recommended that to start out with people should be using the same two rope as water skiers because it is easy to grip and has just the right amount of give. Quarter horses dominate the sport right now because of their quickness in the quarter mile, with draft horses also doing well because of their giant feet being able to grip the snow really well. 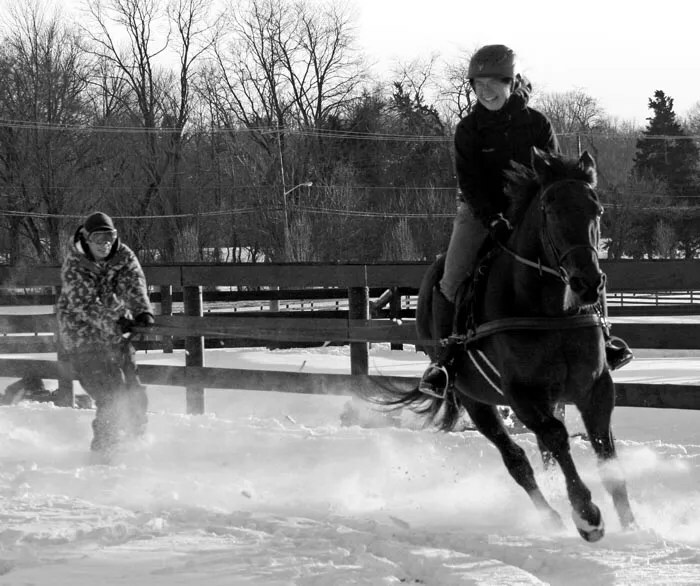 I think Phoenix would be perfect at Skijoring because he is a quick pony with big feet and a love of snow! So besides NowTHATSaTrot whose pictures is above (and who promised me that Phoenix and I can be a part of the Skijoring fun next year) has anyone else out there tried Skijoring out? I think it looks like a total blast! Check here to see if there is any Skijoring going on in your neck of the woods so you can see the action first hand! Oh and as for yesterdays contest, yes that was a tire so Lindsay you are the winner of a new white saddle pad so congrats and you should be expecting an e-mail from me shortly! ← Hey! That’s Not Gennyral! Hmmm. Plowing around in a field would be fun. Racing like that on a street…no way. I’m a decent skier but prefer that I have my own brakes. Even in water skiing when you drop the rope you don’t go far before you slow down and stop. On snow like that…you could slide a LONG ways before you came to a stop if you didn’t fall first. I don’t wee why people have to think up new ways to crash and burn with horses when the old ways hurt just as much as they ever did! I think it looks like fun … as long as I’m the one on the horse! We don’t run flat-out like the riders in the video, but we do have a lot of fun! Our skier is a pro who already does crazy X-games style stuff, so he jumped at the chance to try skijoring with us. We didn’t have special equipment but we converted two harness breastcollars and attached driving lines or longe lines for our skier to hold onto. Obviously, our horses are already broke to drive, so that made it easy, but we still took the time to experiment in an enclosed area to make sure they were okay with the sight and sound of the skier. Willie thought there was something wrong with the skier’s feet, but since he kept providing cookies at the end of every run, Willie learned to look forward to getting him home safely! A word of caution for those that do try it — moving through snow is hard work for the horses, especially if they aren’t used to towing! Take it slow at first and give your horses a chance to rest often. Skijoring is lots of fun for us humans but it should be fun for the horses, too. Are there some instructions on how to hook up the rope to the saddle without just wrapping around the saddle horn?